Free nights, late check out and more…. BEST SUNSET IN KLONG MUANG ! FROM 999 THB ONLY ! Loyalty members receive additional benefits. Soft-opening pre-buy rates from 1199 THB only ! Our budget hotels and residences offer a modern and affordable boutique hotel experience in some of Thailand’s most popular travel destinations including Bangkok, Phuket, Krabi, Pattaya, Chiang Mai and Khon Kaen. Some of our hotels are equipped with the top of the range facilities, which include roof top swimming pools, fitness centers and vibrant stylish “Chill in” lounges. All iCheck inn and Boutique hotels provide free WIFI and coffee. Experience a Hassle-Free Accommodation at Budget Hotels in Thailand! Be it a family trip or an excursion for work, iCheck inn hotel offers you the best understanding for your either needs as they offer an entire administration by keeping up the bar of their Boutique Hotel in Thailand. The Hospitality and the superior offices not just give you an ideal place to rest and revive yourself yet additionally assist you with planning about and get more out of your get-away involvement. At ICGEC we assure you an unforgettable experience at our Hotel in Thailand. You’ll discover subtle elements of a number of places to continue in the settlement area of different voyagers, their blog, and third-party articles yet that might delude. In this way, in the event that you need a place where there is no uncertainty of being off-base then you should take a gander at our Hotels Section at iCheck Inn Thailand. We offer a standout amongst other Budget Hotels in Thailand. You may feel much more flabbergasted when you visit, and, in some cases, the costs are truly mind-blowing that you won’t feel like you are vacating. 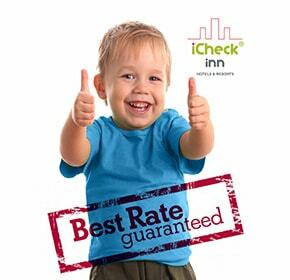 Deals & Offers iCheck inn! KRABI - UNBEATABLE RATES ! Loyalty program made easy: Book direct at lower rates and redeem free nights + more benefits at any of our properties. Some of our Bangkok, Samui, Phuket and Chiang Mai residences offers distinctive serviced residence ranging from studios to three-bedroom with state-of-the-art facilities, perfect for monthly / long stays. With free wifi, fitted kitchen, fitness and swimming pool we will have something that will suit a range of lifestyles. In addition, some of our properties are also pet friendly. Stretch your Bahts when you take a holiday in Thailand. Enjoy attractive rates when you book to stay at any iCheckinn Hotels, Studio Hotels, Aspira Hotels and Resorts, Syama Hotels. Get a free upgrade to the next category subject to availability. All bookings must be completed by 30 April 2019. Stay period is from 1 April 2019 to 31 July 2019. Great location, very comfy room, excellent lobby design, the receptionist really kind and helpful. Silom is a great neighborhood, there is a 7 11 close to the hotel,many banks and useful things. The street where the hotel is located is really secure. I will come back again for sure!! !